Thinking of renovating your home or just moved to a new house? An unusual door knocker is a fantastic yet relatively inexpensive way to stamp your own personality on it, before you do any of the hard work that renovation normally involves. One idea is to go for an animal-themed door knocker. Some animals lend themselves better to this than others, and some are under-represented in the door knocker world (I've never seen a skunk door knocker, for example). But nonetheless, there's still plenty of choice. Read on, and see what you think. This door knocker is the purr-fect piece for cat lovers to invite their guests inside. Mayer Mill Brass is a small family owned company starting out 35 years ago with one item. We have grown with an inventory now exceeding 600 pieces. Many of us are devoted owners - sorry, servants - of one or more cats. And what better way of announcing this fact than by attaching a cat door knocker to your front door? 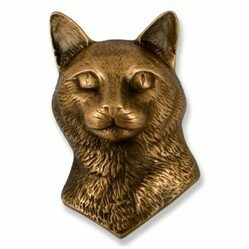 The cat's head door knocker featured here is by Michael Healy is hand-crafted from brass with a bronze finish, and has a protective coating. Mounting hardware is included. It is 4 inches wide and 6 inches high. If you want the whole body of a cat rather than just the head and shoulders, Mayer Mill Brass' cat door knocker is made from solid cast brass and looks like a handsome creature, with his paw lifted in welcome! Not for nothing are dogs considered to be "man's best friend". If you've got a much-loved dog in your life, why not tell the world by decorating the outside of your house with a dog-themed door knocker. The boxer dog door knocker featured here is by Michael Healy, and looks really handsome and three dimensional! It's made in the USA and is hand-crafted with a bronze finish. Whether you have a German Shepherd or you just like that particular breed of dog, Mayer Mill Brass' German Shepherd door knocker could be for you. It's hand cast in North Carolina, and measures about 9" long x 4" wide x 3" deep. Pit Bull's door knocker is a keenly priced but very attractive option. The description doesn't say what metal it's made from, but it measures 3.5 inches across from ear to ear and the ring for the knocker is 2.5 inches in diameter. UPC: 794685146473Overall length from top of head to bottom point is 6.5"Widest width from ear to ear is 3.5"Ring for knocker is 2.5"
Frogs make highly attractive doorknockers, as I hope you'll agree! I was especially taken with this green tree frog door knocker, which measures 6 inches high by 5.5 inches across. He has unpainted brass feet and eyes, which is a nice touch - not to mention a smooth finish, exactly as you'd expect in a real frog! The green Monarch butterfly door knocker is made from solid brass, with a green patina on its wings. Again, it's designed by Michael Healy and is hand made in the USA. Monarch butterflies have a real wanderlust; every year when the summer is over, they migrate from Canada and the northern states of the US down to Mexico. This brass version of these well-travelled insects is 7 inches high by 7 inches wide, and is also available in a plain brass finish. SPI's butterfly door knocker is a good alternative if your budget is a bit lower. It too is made from solid brass. If you don't want the shape of a butterfly (but you still want butterflies to appear in the design somewhere), then SPI does a beautiful rectangular brass door knocker with a detailed design featuring butterflies and flowers. There are a few gorgeous dragonfly door knockers available on Amazon too - the one that caught my eye is the oiled bronze one by Michael Healy. Like the frog, it's also available in other finishes. And Mayer Mill Brass also does a dragonfly design similar to the Michael Healy one, but with a more budget-focused price tag. Hope you enjoyed reading this - check out my other pages! Rectangular Brass DoorknockerBeautiful Ornate But Understated Design Constructed Of Brass And Stunningly Detailed.